Its a unique home gadget equipped with latest ultrasonic technology works quietly and very effective. Just take off its easy opening cap, add water and essential oil and feel the effect with your own. It adds nice and smooth mist which soften and moisten your skin mostly in winter. It also helps you breathe better when you are sleeping in an air conditioner. 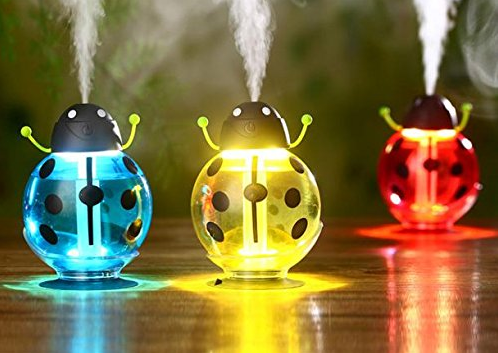 Aroma LED Humidifier is a healthy lifestyle gadget which is great for an Aroma therapy helping you a great relief from stress, create better surrounding feel and easy to daily use gadget. It is made using durable ABS plastic, has a very natural and primitive design and you can select many color lights to suit your facilities such as Office, home, Bedroom, Living Room, Study room, Yoga Spa and more. You can add aroma oil into the water to create fresh feeling air. It easily removes odors and smells from rooms. Increases humidity of the air and help to moisturize your skin. Works on just 5V input. Comes with Red, Blue, and Yellow color options.